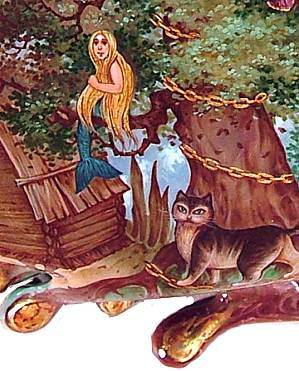 This beautiful work by Fedoskino artist Sergey Zotov shows "Lukomorye", a world far different from our own, with its mermaid and wood sprite, Baba Yaga and the chicken feet hut, the tree with a gold chain around it and the prancing cat. 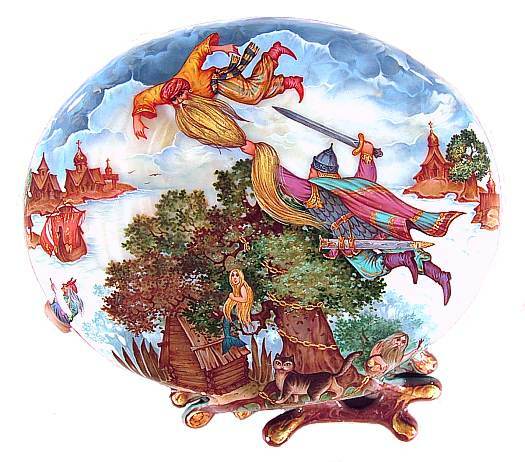 Lukomoye is the famous preface to Alexander Pushkin's fairy tale "Ruslan and Ludmila", and here the mermaid and all the characters have an ideal vantage point to witness the great battle in the sky between Ruslan and the evil wizard Chernomor. Fedoskino artist Sergey Zotov has depicted the moment just before Ruslan slices off Chernomor's beard, vanguishing his rival and leading to the freedom of his bride Ludmila. The box is beautifully done with part of Lukomorye and Baba-Yaga's morter being skillfully sculpted from papier mache and protruding away from the box itself. 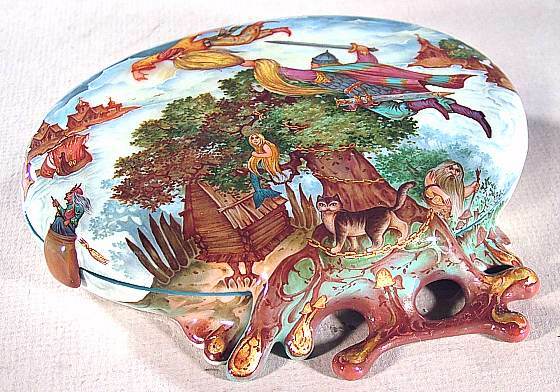 Much of the sky and ocean are inlaid with an iridescent piece of mother-of-pearl, and fine touches of gold provide a beautiful radiance in places like the wizard's beard, the mermaid's hair and Ruslan's cape. As usual, Sergey Zotov has created a wonderful fairy tale scene and a totally unique work with a high level of intricacy. As a minor example, the sculpted sections of the box are positioned perfectly so that they rest flush on the surface of the table when the box is closed. One might be tempted to take things like this for granted, but work this precise is extremely time consuming, yet necessary, if an artist is to make a truly refined work of art like this. The box is made out of high quality papier mache and has a hinge at the top. It is signed by the name of the artist and the title.